Construction Progress: Workers have completed installing the deck panels on the south side of the Skirball Bridge. Crews plan to pour the bridge deck this month. Following on the heels of “Carmageddon” — the highly successful closure of the I-405 for Mulholland Bridge demolition work in July — the 405 project team has a meeting with the community Thursday night, August 18, in Los Angeles. The purpose is to provide a progress update on the I-405 Sepulveda Pass Improvements Project, including the next steps for the Mulholland Drive Bridge and upcoming work to widen the Wilshire Boulevard underpass and improve the ramps between the 405 and Wilshire. The community meeting will be held at the Mirman School Auditorium in in Los Angeles (6 to 8 p.m., Mirman School Auditorium, 16180 Mulholland Drive). There will also be updates on all three segments of the massive $1-billion-plus project to add to a carpool lane to the northbound 405 between the 10 and 101 freeways. The scale of the work now in progress is dramatic, with multiple freeway ramps, undercrossings, bridges, retaining walls and utility work occurring throughout the entire 10-mile project. The presentation will show visual progress on all these fronts, as well as provide timeframes on anticipated roadway and freeway lane closures. Last month’s closure of the 405 was a success both for the project team that staged an outreach campaign to convince Angelenos to stay off area roads and for the contractor who finished the demolition and cleanup work 17 hours early. 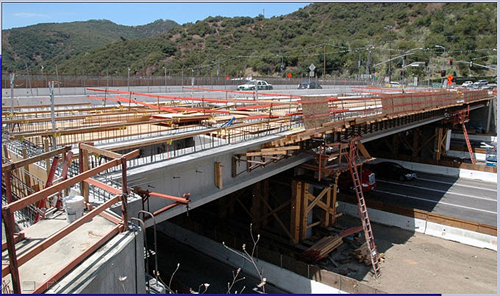 While the next full freeway closure associated with north side Mulholland bridge demolition is slated for mid-2012, the exact dates will be announced when construction is farther along in the project schedule. The contractor at present is making plans for shoring work on the bridge abutments and column footings. But the goal is to provide as much public notice as possible to allow the public ample time to prepare. Thursday’s community presentation will discuss the Mulholland closure and identify the other important work within the Mulholland segment, including reconstruction work on the Skirball Bridge, utility relocation and freeway overpass/bridge widening. In the Sunset segment, widening of the Montana undercrossing continues, as well as bridge and ramp construction at the Sunset Bridge. One of the next big upcoming construction deliverables for the Wilshire segment is the widening of the underpass at Wilshire Boulevard and reconstruction of its eight ramps and connections with the 405. The project will build new flyover ramps that separate traffic trying to get onto and off of the freeway at two critical intersections, which should improve safety and traffic flow. But the work will require ramp closures ranging between 14 and 90 days. The first extended 90-day closure of the Westbound Wilshire Boulevard on-ramp to the northbound 405 and northbound 405 off-ramp to Westbound Wilshire are currently expected to begin in November of this year, according to the presentation. Below is a rendering and aerial view that provides a good idea of what the ramp work is about. This view from Google Maps shows the present-day problem: traffic exiting the northbound 405 to go west on Wilshire must mix with eastbound Wilshire traffic trying to enter the northbound freeway. There’s a similar problem on the southbound side of the freeway: traffic from westbound Wilshire is trying to enter the 405 the same time southbound 405 motorists are trying to move to the right to exit to eastbound Wilshire. This rendering shows the solution to the ramp flow problem: traffic exiting the northbound 405 at Wilshire will no longer have to mix with traffic trying to enter the freeway from westbound Wilshire. The same applies to the southbound 405; the flyover ramps allow traffic to enter the freeway from westbound Wilshire without having to mix with drivers trying to exit to eastbound Wilshire. This is one of the most significant improvements being made as part of the project and should bring badly-needed ramp capacity to the Wilshire Boulevard-405 interchange, which is one of the region’s and nation’s busiest. Is an Expo-adjacent Apple Store bundled with transit incentives coming to Santa Monica? The plans, as shown in the renderings, appear to widen the Sepulveda-Wilshire intersection while making no attempt to improve pedestrian safety in the area. Is there not some irony in the fact that, when the Westwood-VA Purple Line subway station opens, one of the first things pedestrians will see upon exiting the subway is an intersection that is essentially impossible to navigate safely? That’s a good point Allon, I think the source should do an article on the VA station since that seems to be the least clear as to what the plans are for it and how it will accommodate pedestrians, parking (since it is an end point station until further extension), and station portals. On that note, I know the plans may not be finalized yet but at least it would get a good discussion going about it.